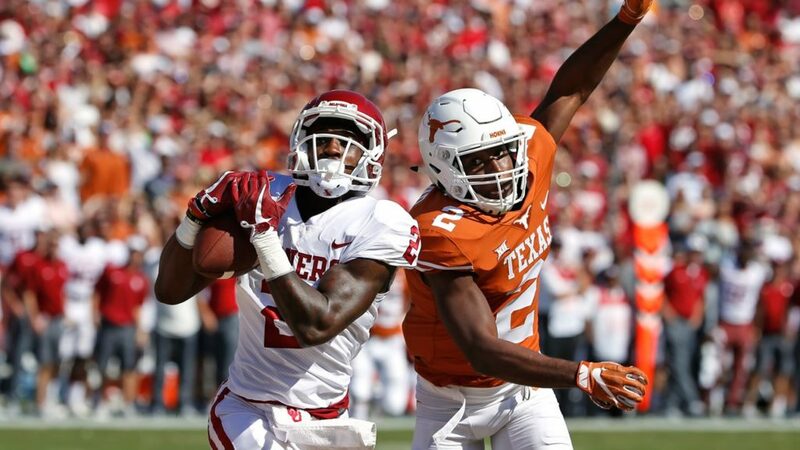 Another entertaining game between Texas and Oklahoma took place yesterday, and the Longhorns came out on the losing end of it for the second year in a row. #12 Oklahoma got the 29-24 win after a 59-yard TD pass from Baker Mayfield with 7 minutes to play put the Sooners on top, and that was the final score of the game. Here are some of my thoughts from the game. – Resilient Again. There is some good and bad in this note. The bad is that for the second straight week Texas came out of the gate slow, especially on the offensive end. They did next to nothing on the offensive side of the ball in the first quarter, and the defense came out and looked to be a step slow compared to the OU offense. With 4:30 left in the first half, OU lead 20-0. The good news is that Texas was resilant for the second straight week and overcame the slow start. They scored 10 points in the last 4:30 of the first half to cut the Sooner lead in half. And they outscored the Sooners 24-3 at one point to take a 24-23 lead with 8 minutes to play in the game. It wasn’t enough to get the job done, but it was impressive to see. – All-Ehlinger. QB Sam Ehlinger turned in another gutty performance on Saturday. Finishing 19/39 for 278 yards and a TD passing, and rushed for 106 yards and a TD on 22 carries. That’s 384 total yards for Ehlinger, that means only 44 yards of offense came from someone not named Sam Ehlinger. It’s great to have a QB that can have performances like Ehlinger has had over the last two weeks, but someone needs to step up in the run game. Chris Warren had 6 carries for 4 yards, Toneil Carter had 5 carries for 6 yards, and Kyle Porter had 3 carries for 7 yards. Part of those issues have to do with the offensive line, but the run game outside of Ehlinger was really bad on Saturday. – True #2 WR? Everyone knows Collin Johnson is the #1 WR for this team, and Oklahoma treated him that way on Saturday by doubling him a lot. That leads me to the question who is the #2 WR on this team? In my opinion that guy is Reggie Hemphill-Mapps. He finished with 4 catches for 44 yards, and 2 of those catches and a huge chunk of those yards came on Texas’ TD drive to take the lead in the 4th quarter. Hemphill is a guy that is easy to get involved out of the slot because he can get open easily on the short routes and in the screen game. He needs to be the go-to guy to start the game if teams are doubling Collin Johnson. I was surprised they didn’t look to Hemphill more in the first half to try and help spark Sam Ehlinger and the Texas offense. – Texas Defense, Bend Don’t Break: In most of the first half, the Texas defense looked a little shell-shocked. Between Baker Mayfield and the OU offense clicking on all cylinders and the Texas offense having trouble just getting a first down. It looked like it may get ugly quick. When Texas cut the lead to 20-7 with 3 minutes left in the half, a big drive faced the Texas defense. The OU offense went right down the field on them until John Bonney fooled Mayfield and picked him off on 4th and 3 at the Texas 31. Texas went down the field to make it a 20-10 game at half and the defense had a lot of momentum. One thing that really helped Texas was that Oklahoma went away from Trey Sermon and the run game for most of the second half for whatever reason. He finished with 96 yards on 20 carries but was having a good amount of success right up the middle vs the Texas front 7. Texas played a bend don’t break style of D as OU kicked 3 short FG’s, that could’ve ended up in TD’s. Though the coverage breakdown between Brandon Jones and PJ Locke in the 4th quarter ended up being the game. – Physicality. One thing I’ve seen in 2017 that also really stood out from this Texas team vs OU, and that’s physicality. On both sides of the ball, it doesn’t matter if it’s Malik Jefferson getting dirty on the inside blowing up run plays or Sam Ehlinger pushing Chris Warren into the endzone on the goal-line. This team is so much more physical overall than we’ve seen over the last few years. And it’s a lot easier to win with a more physical but less talented team, compared to an extremely talented team that’s soft. That’s a reason why Tom Herman and his staff work and push their players so hard in camp, so it shows on the field in the fall. – What’s Next? Texas sits at 3-3 (2-1 in Big 12) with Oklahoma State coming to Austin next week. After the Maryland game, Texas has played 5 straight games of really solid football. The issue is that they’re only 3-2 in that stretch. Though the two losses were by a combined 8 points vs two Top 13 teams in the nation. But I think just about everyone in or around the Texas program knows that moral victories mean nothing. Texas will likely get RG Jake McMillon back next week and that will help. If they could put a complete game together vs the Pokes and get off to a 3-1 start in conference play that would set up really well. I’m not sure that happens as OSU is going to have a play action passing attack that will be more lethal than Oklahoma’s, and Texas really struggled vs that on Saturday. You can tell that this team is ticking in the right direction, but when will they actually turn the corner and stop having to settle for “moral victories”?